Bad audio leads to inefficient collaboration. Inefficient collaboration leads to poor results, and poor results can lead to some major issues. Our ability to collaborate is only as good as the hardware we rely on. In fact, clunky, annoying, incapable and confusing hardware is the exact reason most conference setups go unused day after day. Now, I’m not saying your team needs to shell out the money for some super fancy, modern, collaborative digital whiteboard. If you’re just looking to hold some basic phone conferences, that would just be over kill. But at the same time, we often see the hardware choices for conference rooms being over looked. Instead on buying “whatever works,” we can drastically improve the quality of conferences just by choosing the right style microphone for any conference room system. 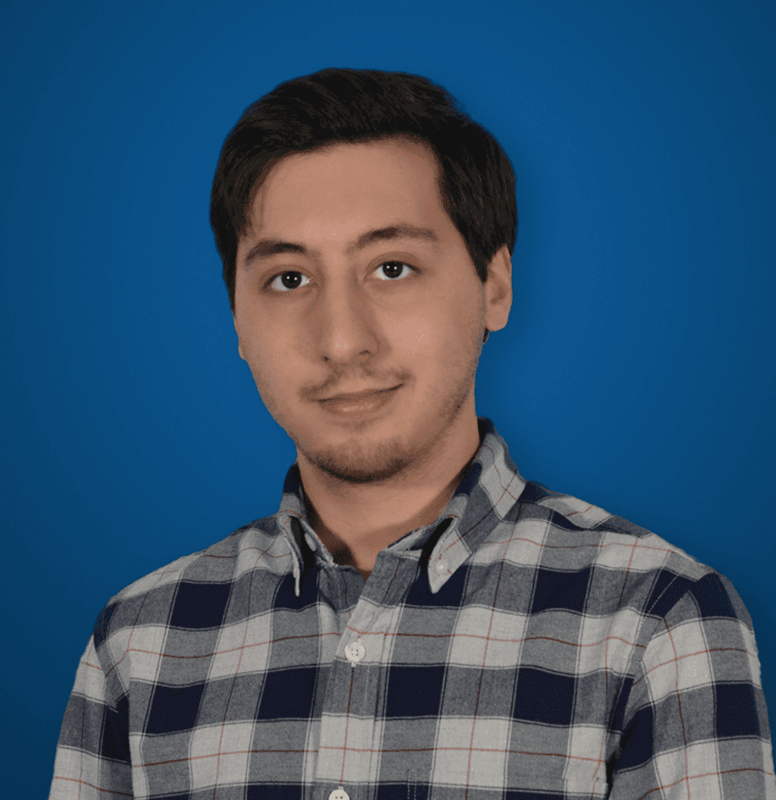 Why Do I Need Special Conference Room Microphones? Just like most things in life, there really isn’t a one-size-fits-all best option to always swear by. Depending on the size of your conference room, the size of the table or even seating arrangements, you’ll have drastically different needs. Of course, a tiny little huddle room doesn’t quite need an expensive wireless setup, or individual goose neck mics for each individual speaker. Since everyone is, well, huddled around one desk something simple and stationary would work fine. But, on the flip side, that massive conference room with a 12-foot-long desk aligned with chairs — just one microphone in the middle of the table is going to make Steve on the other end sound like he’s somewhere out in Guam. Even going beyond just the room layout, your team might have some specific audio requirements for their hardware. Some setups might allow for users to mute their individual mics, but others might just be one single mic and muting would mean cutting out everyone. 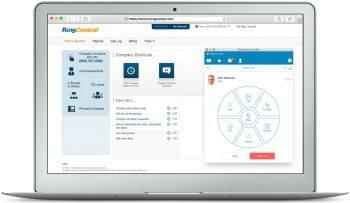 Usually you can also play with other functions like noise levels, wireless microphones, and some teams might even need their mics to play well with their laptops if your business is a big fan of the BYoD approach. All of these different factors will play into your decision, so it’s important to know what you need, and what will work best for your situation. 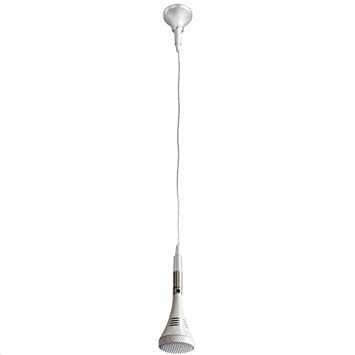 Pretty self-explanatory stuff, a ceiling microphone can either be mounted and embedded into the ceiling for a really clean look, or just hang from above like a chandelier. If your conference room has some really high ceilings, then a hanging microphone might be necessary to ensure it will catch every voice in the room. But either with installation method, these mics are great for picking up an entire room without unnecessary clutter and wires on lining your tabletop. And if your conference room is really large, one mic might not be enough, so multiple mics can be mounted from the ceiling across the room to pick every single voice. These mics also are generally capable of 360-degree audio pick up, and are best for medium to large sized conference rooms. Ceiling mics are really good for when you need to ensure a completely clutter free table or desk. While other microphones take up space and sit on the table, ceiling mics cut down on visible wires, and stay out of the way. Microphones can either hang, or mount right into the ceiling for a much cleaner presentation capable of picking up audio from any direction, even in the largest rooms. Installation might require forward planning, so that you don’t have to rip open your ceiling or walls to install these mics. While microphones are growing more intelligent, these mics can still frequently pick up background noise in the room, and generally aren’t of the same quality as dedicated microphones. 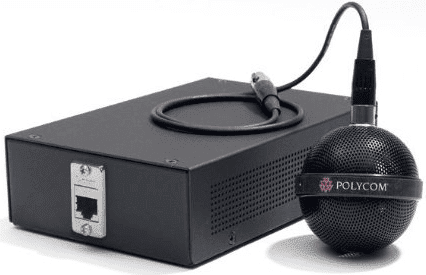 A bit more on the high end side, this Polycom mic might by costly, but for a good reason. As expected, this mic has 360-degree voice pickup, in 22kHz. 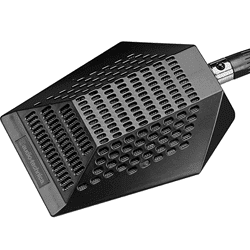 In fact, this mic is so powerful that it can cover up to 2,800 square feet. The entire system integrates with Polycom’s HDX video solution, as well as Polycom SounD Structure solutions. If your business is already invested into a Polycom environment, then spending the extra capital will be worth it. 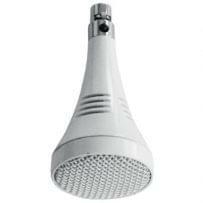 Coming down in price, we have the ClearOne Ceiling microphone kit. Again, this mic has 360 degree voice coverage, but also touts three what ClearOne calls “unidirectional elements” to help reduce reverberations and background noise. Of course the mic is optimized for ClearOne setups, but can generally be used with most solutions. Coverage might not be as impressive as the Polycom, but users can setup multiple mics around a large room for the same price as one Polycom mic. If your office is on a tighter budget, or looking to keep the setup nice and clean, this BeyerDynamics mic might be the right choice. With the ability to embed directly into the ceiling, you’ll never even realize its there — also at a fraction of the cost compared to our two previous recommendations. You still gain wide coverage, however with the boundary style microphone, it might not be as capable of 360 degree voice pickup as the other choices. However, at such a low cost, your team could easily outfit every conference room and still cut down costs. Given the name gooseneck for their uncanny resembles to, well, a Goose’s neck, these microphones are generally considered the best way to ensure perfect quality audio. Each individual seat will require its own gooseneck, so that each individual speaker has their own dedicated microphone. So, instead of relying on one or two microphones to hopefully pick up every single person’s voice, gooseneck mics ensure that everyone is heard. Unlike the previously mentioned ceiling mics, since goosenecks are limited to the speaker, they generally won’t be picking up those annoying background noises. However, the trade off is mainly that you’ll need to ensure there are enough mics on the table for all speakers, which adds a lot more clutter and cables to worry about. Gooseneck mics are one of the best ways to ensure that every single speaker is heard, and heard crystal clear. Everyone sitting around the conference table should have their own mic, instead of sharing one for the entire room. These mics can help prevent annoying background noise by limiting their capabilities to only pick up the sound right in front of them. 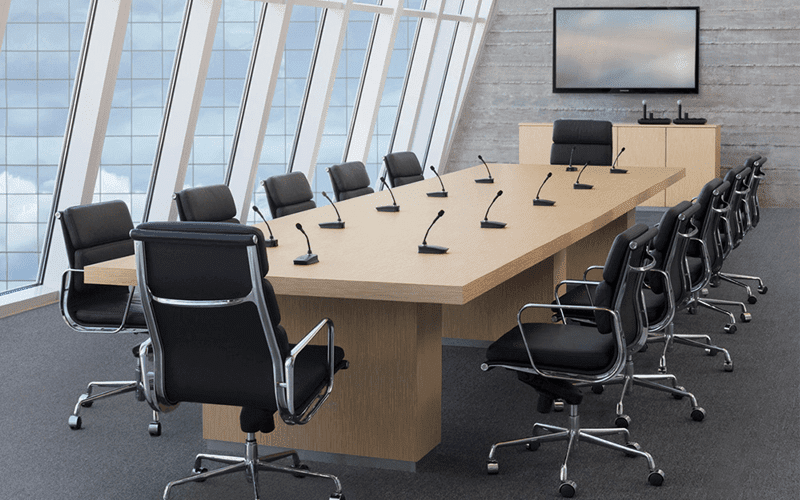 Depending on how many mics your conference room needs, this could lead to a lot of clutter and unwanted cables on the desk — although it is possible to find wireless gooseneck mics, you still have multiple microphones sitting on the desk. Let’s face it, gooseneck mics are pretty darn ugly. No one wants to mess up their office Feng Shui with some ugly mics lined on the table, but it’s a price you might have to pay for the enhanced quality. You can never really go wrong with gooseneck mics, and this Weymic is a perfect example of why. You might need to outfit a conference table with multiple mics, but at such a low cost that shouldn’t be much of an issue. This mic can also run on either plug right into a regular wall socket, or even run on batteries to help cut down on the wire clutter. 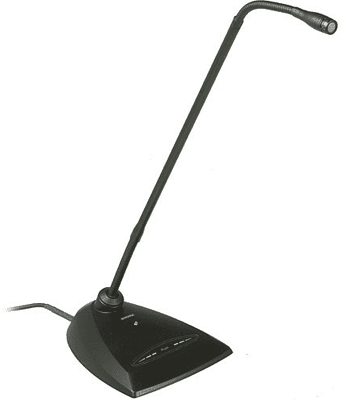 This mic is also available with a metal base to sit sturdy on your table or desk. The average price for this microphone is around $45, available for purchase on Amazon here. 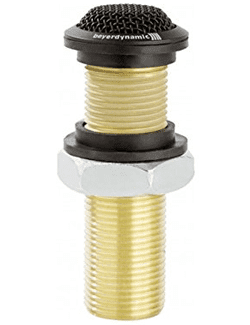 If you’re looking to upgrade to something a bit more premium, then this Shure gooseneck is worth taking a look at. With the same cardioid style mic, this gooseneck will reject any noise that isn’t from the speaker. 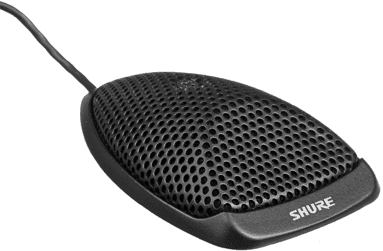 Shure also boasts “CommShield Technology” to help guard against an unwanted RF interference from smartphones and other wireless devices. Shure is also known for their solid build quality, so this microphone won’t be falling apart any time soon. for purchase on Amazon here. Falling right in the middle of the pack, this MXL might be the best of both worlds in the gooseneck category. USB connectivity means this mic even be connected right to your laptop, and a 15″ flexible neck makes it super easy to adjust. For those using MXL solutions already, this AC-400 can be extended with three optional AC-40EXT units for ever further coverage. 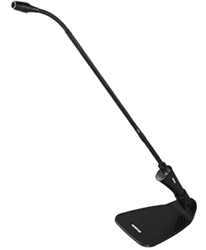 Its also one of the cleaner looking gooseneck mics we’ve seen. While a bit broader than the others we have discussed, boundary microphones are essentially their own class with multiple options to choose from. The idea is fairly simple, the microphone is placed along a “boundary,” which is essentially just a mounting surface. This means the mics can sit on your desk, or can be even be placed on the floor, like on a presentation stage. The major benefit is that boundary mics can pick up the voices of all speakers in front of them. 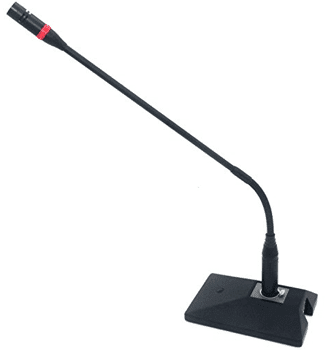 Boundary mics can be had as small square mics that sit on your conference table, or sometimes can even be embedded in the desk, called “button” microphones. This way everything can stay neat and clean with the cables, and almost the microphone itself, hidden within, and under, the desk. Boundary microphones are great for picking up multiple speakers, just one or two microphones placed in the right spot will generally cover your entire conference room. They’re also exceptionally great at picking up voices, and don’t generally pick up lower frequencies. Boundary mics are also generally on the cheaper side, starting around $100 or even less. Since you only need one or two of these at most, your business can save a good bit of money. Similar to that of the ceiling mics, boundary mics can easily pick up a lot of unwanted noise. Since these mics generally sit on, or even in, the table you are using, it can easily pick up a lot of the unwanted tapping, shuffling, and general background noise. Depending on the size of your conference room, your team might need to purchase multiple microphones to fill the entire room. As a well known name for any audio enthusiast, you know you’ll be buying a quality mic when you go with Audio-Technica. This Pro 44 boundary mic is no different, with a wide-range condenser and what AT calls a “low-mass diaphragm” for a superior performance to other alternative mics. These mics run on batteries with no need for external power, and should provide incredibly clear audio. The included cable should help cut down on the cost of purchasing accessories as well, but he main selling point here is the known quality of Audio-Technica. If you are in the search for a boundary mic with a more universal connection option, then the MXL AC404 would be perfect. This mic not only has USB connectivity to plug righti nto your laptop, but even has a built-in headphone and speaker monitoring jack, for those that want to ensure their voice is recorded in the best quality possible, without any annoying level spikes or drops. 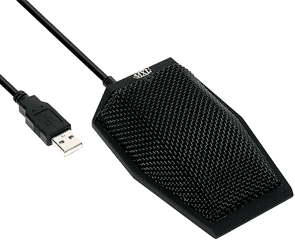 The USB cable is also 6-feet long, so there is some added flexibility in placement and mic location. While not your standard boundary mic, this flying-saucer looking Philips conference microphone is kind of like the best of both ceiling and boundary mics. 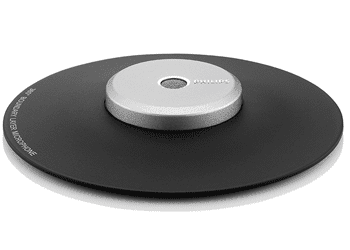 This disk shaped mic is capable of picking up sound from 360 degrees, and also utilizes the vibrations from the table, and even air pressure, to help pick up crystal clear sound. This guy can sit right in the middle of your conference table and still pick up everyone speaking in the room. There are even some more advanced sound options to play with for even higher quality audio. The average price for this microphone is around $140, available for purchase on Amazon here. Probably the more traditional option most are used to are the tried and true speaker phones. Except, they may not be very “true” in that statement. Speaker phones can serve as a great, easy option — although they can get very expensive if you want all the bells and whistles. More modern speaker phones are fairly capable, and now intelligent enough to work alongside your smart phone with some pretty cool integrations. Most speakerphones have color touch screens, and generally employ 360 degree microphones just like the ceiling mics we talked about before. Speaker phones can generally stand alone as the only device you need, allowing users to control everything from the touch screen itself. They usually don’t have a massive footprint on the desk like 12 goosenecks might, and aren’t too bad looking either. 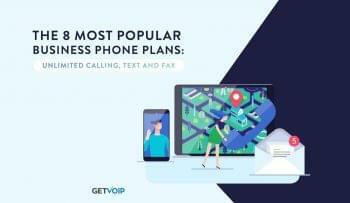 Since we’re looking at VoIP phones, you can expect UC integrations, Bluetooth, and the ability to run multiple lines off one device. Some units even come with their own mini microphones to help expand the range. 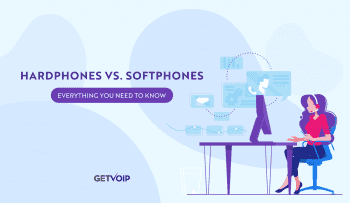 These speakerphones are generally just conference focused VoIP phones, so they bring with them a lot of the great features we’ve grown to expect from VoIP and UC. Stylish, and easy to use, speakerphones don’t take up too much room on your desk yet they are generally capable of picking up voices from up to 20 feet away. Since they’re using the same style 360-degree microphone as a ceiling mic, they suffer from the same issue of picking up a lot of background noise in the room. The idea is a bit outdated as well, although somewhat modernized. While you can find some inexpensive options, the really nice touch screen phones that have all the bells and whistles can start to rise in cost, making them a bit less comparable than other options at the price point. 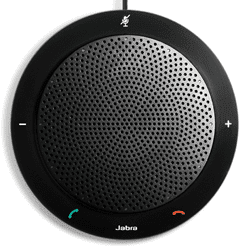 Starting off with the bare basics, it would be hard to go wrong with this Jabra 410. With a USB connection, you won’t need an expensive setup to take advantage of fancy touch screens or phone integrations, just plug and play and its ready to go. The speaker itself is pretty slim and compact, capable of moving wherever you go, and the physical call controls are a great addition. We’ve taken a look at some Vtech hardware before, and were a bit surprised to see what they offer. Surprised in a good way. 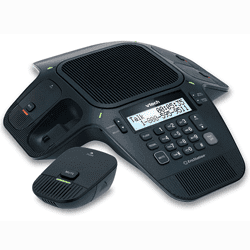 This conference phone setup comes wih four wireless mics that can be placed around the conference room, or on the table, to help pick up every single voice — yet its as simple and compact as any other speakerphone. That’s a win-win. But now for the granddaddy, the Polycom RealPresence Trio 8800. It might be expensive, but it might also be worth it. This unit comes with the touch screen controls I mentioned previously, and of course with amazing audio quality expected from Polycom. 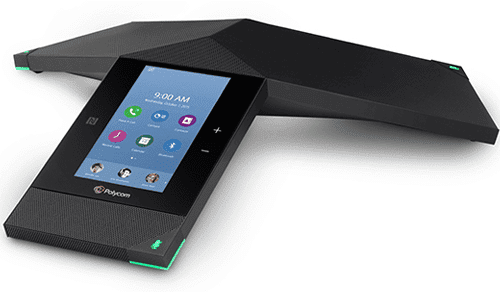 In fact, Polycom touts that this speakerphone is the only one on the market with the capability to share HD content from your own BYoD device for some crazy collaboration.